Key to Kelly Anne’s success has also been the result of her patient demeanor and dedicated work ethic. She knows how to listen, is generous in offering information, and more importantly, knows when to stop talking. Her main intention is to understand her client’s needs and build a relationship that will last over the course of time. When orchestrating deals for her buyers and sellers, Kelly Anne is assertive and effective without being too aggressive. While she is a strong negotiator and advocate for her clients, she is just as much a compassionate, friendly, humorous partner who eases a process that can often be quite stressful. A native and lifelong Georgian, Kelly Anne has resided in the counties of Clayton, Henry, Lamar & Dekalb. 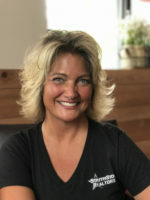 While she offers clients a seasoned knowledge of Henry County where she has resided for the past 3 decades, she is also a property owner in Fulton & Carroll County therefore, she has an intimate understanding of what makes each distinct residential niche so special and unique. As a 4th generation real estate professional, it’s no surprise that prior to becoming a licensed Realtor, Kelly Anne enjoyed a 5-year career in the real estate industry as an office manager. Her comfort level spans serving everyone from high-profile corporate clients to individuals and families looking to find their perfect home.